Executive Printers is proud to be highly involved with local law enforcement. From design to print, business cards to training manuals we are there for the Medley Police force and all branches of law enforcment. 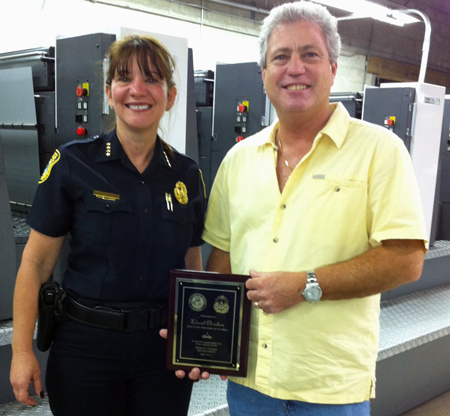 Executive Printers of Florida owner, David Gardner, receiving a plaque of appreciation for all that we do for the Medley Police from Chief Jeanette Said-Jinete. David also sits on the board of the Police Officer Assistant Trust (POAT) as the solitary civilian board member representing non law enforcement. The POAT reaches out to all branches of law enforcement distributes funds to injured and fallen officers families and law enforcement families that are in need. We need to protect our officers and their families to help keep us and our cities safe.